A Life Style with Consequences. Greenway Entertainment and writer/director Steven M. Smith (The Howling, The Doll Master, Borstal, I Am Hooligan, Essex Boys: Law of Survival, Haunted) brings us a twist on the football hooligan story with his latest film. Concentrating on the aftermath of violence and how it affects the psyche of all those affected. A fresh look at the Hooligan Genre. Tony (Jon-Paul Gates, Stone Seeker) was the head of the local football firm until he had a run-in with a Russian football thug and he sustained brain damage, leaving him with long term memory problems. His wife Jem (Sharon Lawrence, Dark Matter) takes care of him and makes sure he takes his tablets and answers his repetitive questions. In his moments of clarity he still wants to run the firm, but ever since his injury his friends Larry (Kevin Horsham, Theatre of Fear) and Pete (Joe Rainbow, Zombie Resurrection) have been handling the affairs of the firm. With the Russian World Cup getting closer the firm want to be involved but there is no chance of any of them getting on a plane. They will have to come up with their own competition and with the fast talking Johny (Matthew Fitzthomas Rogers, The Howling) and Kevin (Jimmy ‘The Bee’ Bennett, Rise of the Footsoldier 3) by his side they will make it a contest and they will involve Tony as well. They challenge Vlad (Earl Ling, Evil Never Dies) to a Five-a-side football match, a Boxing match with @Raging Bill’ (Paul Durso, Borstal) and a Poker game with the legendary Tex Mex (Hans Hernke, Shadow of the Monarch). All the while Tony wants retribution for his injury, but with a Swiss cheese brain will he find the clarity to gain closure? 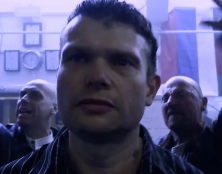 Red Army Hooligans is the thinking man’s hooligan film, with a bit of hooliganism thrown in for good measure. This is another Great British Independent film from Greenway Entertainment, Keeping the home-grown film alive and kicking and batting.